The Ton Anniversary Release: Day 1! 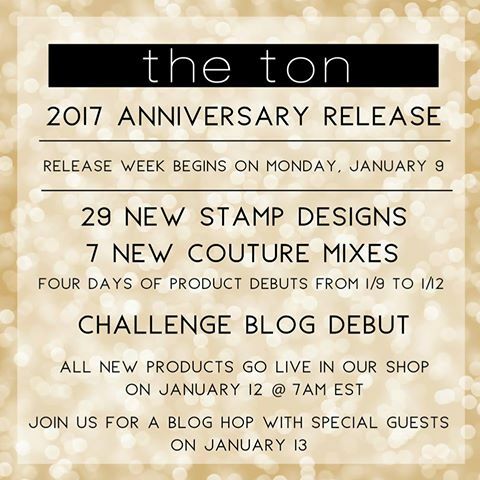 For The Ton’s 2017 Anniversary, Effie has released 29 new stamp designs and 7 new couture mixes! There are several exclusive* gifts with purchases that you can obtain with this new release. This promotion does not apply to prior purchases. The threshold amount is calculated before taxes and shipping. This promotion will continue until January 19 at 11:59pm EST or until supplies last. Limit one GWP (Gift With Purchase) package per customer. Spend $150 or more: Receive a 3×4 Lone Poppy Set (and Flutter Mini Set and Cotton Candy Puff Mix). *You may be able to find these GWPs at your international retailer. These GWP items will NOT be available at any other U.S. retailer. Isn’t that fantastic?! Freebies just for shopping! Love it! For my first project, I chose to work with the absolutely stunning Scripty Alpha Upper and Lower to create a cute, child-friendly card. Now, I know one wouldn’t normally put The Ton’s Couture Stamps and child-friendly together, but I have two three year olds, as well as lots of friends who are still having babies, so I occasionally need a card that is baby- or child- friendly. (Haha!) I started by stamping the bear from Honey Bears using Archival Ink on watercolor card stock. I laid down a mask of the bear, then stamped the balloons (from a set to be debuted later this week!) and did some watercoloring with my Zig markers. 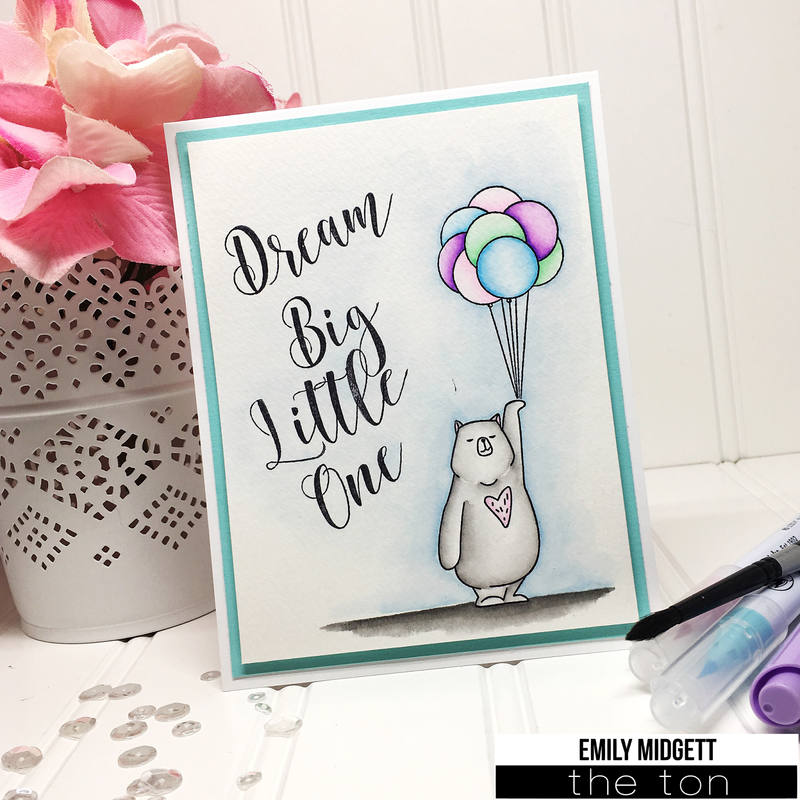 After I had finished adding color, I stamped the “Dream Big Little One” using the stunning new Scripty Alpha set. Seriously, such a gorgeous alpha set. You neeeeed it. And they’re so easy to line up. I stamped this panel in a matter of a few minutes using an acrylic block. I trimmed the panel down, then mounted it with foam tape to a panel of coordinating turquoise card stock and placed it on my white A2 card base. Easy peasy! My other project for today uses the new Thoughtful Poppies set with my beloved Zig markers. After all of the red and green and jewel toned projects of the holidays, I wanted to play with some pretty, springy colors (even though it just started getting cold around my neck of the woods in the last few weeks!). 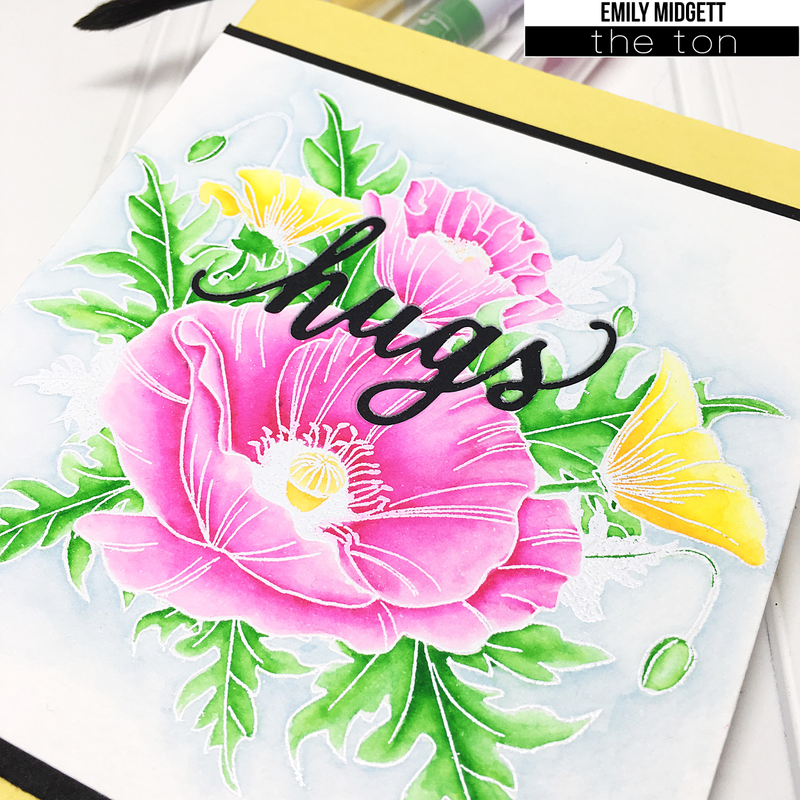 I heat embossed the pretty poppy bouquet onto some watercolor card stock using white detail embossing powder, then watercolored the pretty blooms with my Zig markers and wet paintbrush. After I trimmed my panel down, I die cut the word “hugs” from the center of the bouquet… let me tell you, it made my heart race a little to die cut over my meticulously-colored bouquet… but all turned out fine. I saved the little negative bits, backed the panel with black card stock that was slightly longer than my watercolored panel, then glued the negative bits back onto the black card stock so that the black cardstock really popped through for a very simple sentiment. To bring out the smaller yellow blooms, I mounted both pieces to a yellow card base. Well, that’s all for my projects today! Now for even more fun announcements! First: The Ton is launching it’s own challenge blog! The Ton’s new Challenge Blog is now live! We’ll be playing with a new monthly challenge that begins on the first of every month. The theme for our first challenge is “Celebrate”! You’ll hear more details about the stamps used on it later this week! Be sure to head on over to the blog to get all of the details on how you can enter your own project and be eligible to win a prize from The Ton! For each Release Day (1 through 4), The Ton is giving away a $50 gift certificate! So there are four $50 gift certificates up for grabs! To qualify, you must leave a comment on The Ton’s Daily Release posts. Leave a comment on each Design Team member’s blogs to increase your chances of winning.One stamp set of choice for 7 commenters from each of the Design Team member blogs during Release Week (Days 1-4). The comment period for all giveaways will close on Monday, January 16th at 11:59pm. Winners will be announced thereafter. 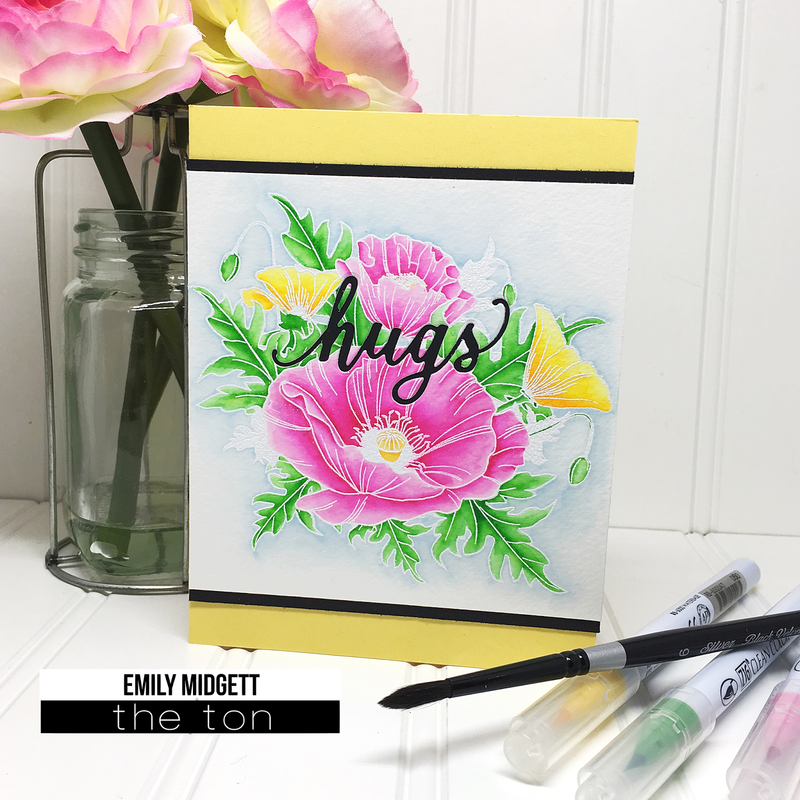 Join us back here tomorrow for more gorgeous stamp set reveals, giveaways, and beautiful projects from our Design Team! Have a fabulous day, friends! Oh Emily, your colouring never disappoints! I love the card with the bright poppies, it's just stunning! One can never go wrong with bright colours, isn't it! These are so bright and great! Love them. Outstanding artwork! Each one is creative, perfectly colored and beautifully designed! Oh my goodness, these are awesome! The floral card is stunning, and the bear with the custom script sentiment is perfection! I love your cards Emily, so beautiful. Great new stamp sets and the Script font is lovely! Very pretty cards. I'm loving the stamps from day one of the release and can't wait to see the rest. Thanks for sharing! Great cards, I especially like the butterfly Strong card, it is stunning! Great cards! Love the vibrant colouring. Fantastic new images. The Ton is da bomb when it comes to floral images. I have not hounded you recently so I will now — PLEASE make a video teaching us novices how to color like Emily. Love your work. Your cards are so lovely and the colors are really pretty!! Beautiful cards, the first card in particular is just so adorable! Cute bear and balloons card and lovely floral and butterfly cards. Love them all! Especially the butterfly one at the bottom! Awesome work! Oooh I love the way you colored the poppies! So pretty! Great color choices on the Thoughtful poppies. It's always good to see non-traditional colors for different flowers. i can never get enough of those bears or the dogs! these poppies are just fabulous!!! love this release and your cards! The bear card is adorable & I LOVE those amazing poppies! Your coloring is superb!! Great cards! Especially loving that second one, I love the brightness and freshness of the florals! Fabulous work, it is sweet, it is cute, it is beautiful! Fabulous cards! Love the poppy card especially! Great cards! Those poppies are truly amazing!!! I love your coloring in the bright, bold poppy card, and your bear card is too cute! Love the watercoloring of the flowers! Wow, your poppies card just blew my mind! Gorgeous! Love the pink and yellow poppies, gorgeous coloring and beautiful cards! Love your beautiful cards. Wonderful coloring. You caught the spring colors so well. Your Teddy bear card was very cute. Most talented lady thank you. Love your work, those poppies are gorgeous. Gorgeous cards, love how they're all so different – shows the versatility of the new release! It's hard to choose a favorite, but I think the poppies win! Although they're all so lovely! The poppies are just lovely. I like how you put the black behind the die cut. Really makes it pop. Beautiful cards and coloring! Love the design of your butterfly card! Beautiful cards, thank you for sharing! Your cards are a delight, but I find that Hugs poppy card just extra special!! Beautiful cards!! I love your second card! The sentiment in black looks very pretty against the flowers! The shading on the poppies is wonderful. Love the little bear with his balloons. your cards are absoutely beautiful!!! That first card is adorable! And so sweet; definitely perfect for a baby. And your second card is GORGEOUS!! Love the colors. Beautiful cards! Love the bear and the coloring of the balloons so sweet. And of course the flowers are amazing! Great job. Your Thoughtful Poppies card is so pretty! I just can get my Zigs to create cards that look like yours. Mine must be defective! ha ha Seriously, both cards are wonderful! I love your beautiful cards! The little bear holding the balloon is adorable! The bright colors you used to make your cards catches the eye. Thanks for sharing. Your card with the butterfly and flowers gives a relaxing feel when you love ok at it because the colors are so soft. Thank you for sharing your work. wow, very lovely colours. Love the poppies. My heart races, too, when I die cut into or stamp onto a perfectly coloured image! Your cards are gorgeous! The bears w the balloons is adorable!!!!!! So well colored! I LOVE it! All your creations are lovely! I especially liked the bear with the bold saying! AMAZING cards Emily! This poppy set is gorgeous and I am also loving the alpha sets! You make such lovely cards. Thank you for all your inspiration. I can't choose a favorite because all of your cards are amazing! Love both of these! The first one is so lovely with the yellow and bright pink! They really compliment each other well! Your challenge card has stolen my heart! Absolute perfection! !1 I love the colors and the butterflies are stunning! TFS! You can never have too many butterflies on a card! Such great cards and they are all so different! Some affiliate links are used in my posts. This means that, should you click on one of my links and purchase something from that company, I will receive a small portion of the sale at no extra cost to you. I use the money earned from these sales to help maintain my blog. I so appreciate you visiting and, if you do choose to use one of my affiliate links, thank you so much for your support! Copyright © 2017 · Sixth Street Sundries by Emily Midgett · All Rights Reserved · Blog Designed by Riss Blog Design.